Dry roast the nuts together in a large pan over medium-low heat until aromatic and a light toasted color, about 3-4 minutes. Transfer nuts a plate and allow to cool. Using same pan, add seeds and lightly pan roast, 2-3 minutes. Transfer to same plate with nuts. 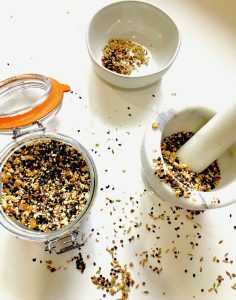 Working in batches, place in a mortar and pestle and pound nuts and seeds to a coarse grind (or as much as you can). Add salt and pepper to nut and seed mixture; mix until well blended. Use on soups, salads, fish, eggs, olive oil dipping sauce or just about anything!